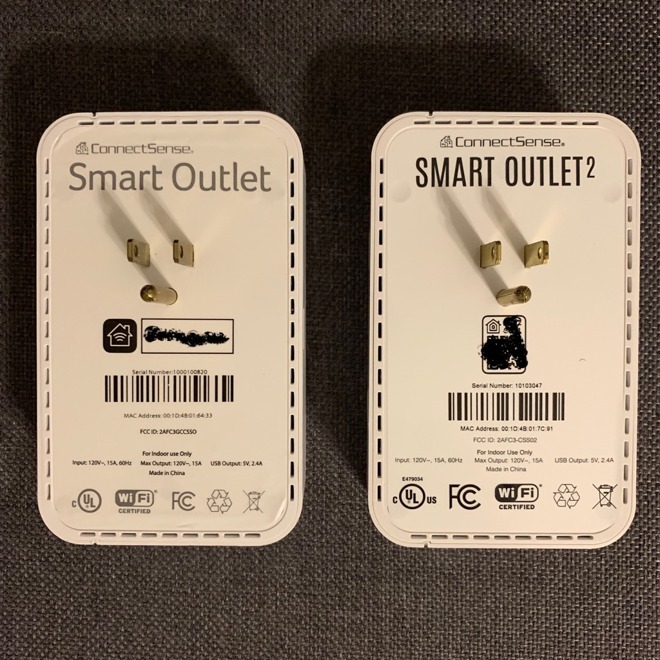 At the Las Vegas Consumer Electronics show, AppleInsider met up with ConnectSense and got to try out the second version of the company's smart outlet, with HomeKit, Google Home, and Amazon Alexa compatibility —without a bridge. The new ConnectSense outlet looks very similar to the initial release. 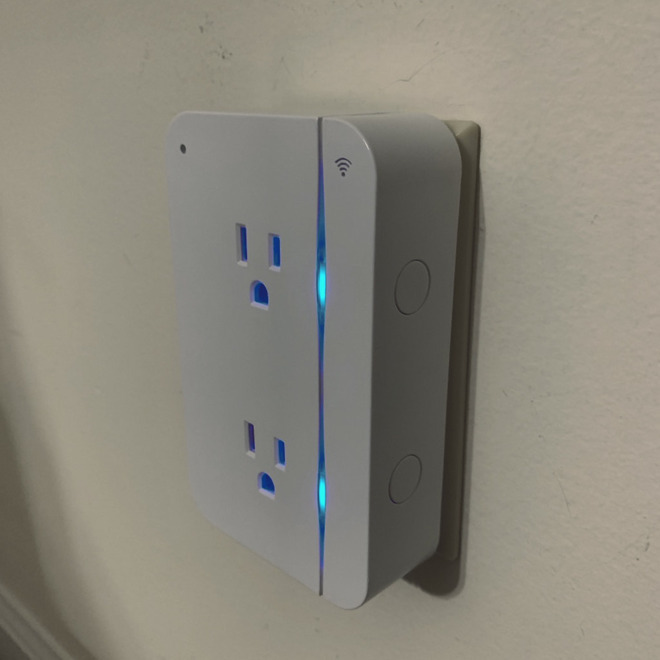 Where many competitor smart outlet plugs are single outlets and are big enough to block the second outlet on your wall making it unusable, ConnectSense plugs into the upper outlet and blocks the second one with a HomeKit switched outlet. As a result, the end user experience is what you'd want to see —you have two HomeKit switchable outlets. Operating them is simple enough: there's a thin light strip that illuminates up with blue next to the outlet when switched on. The switches can be toggled on or off from either of the two round pushbuttons on the side of the SmartOutlet, or by HomeKit in Apple's Home app. Like the first model, there's also a 2.4 amp USB port on the side, suitable for charging any USB peripheral. Things are a little different with version 2 from a connectivity standpoint, though. In the past, we used the ConnectSense app to connect the peripheral to Wi-Fi, added the device to Home app and controlled it via Home. Done, and out. Google and Alexa require cloud accounts. If you want to take advantage of either of them, you'll need to download the ConnectSense App and create a ConnectSense account. Once you've done that, then you can link your ConnectSense account to your Google Account in the Google Home app so that Google Assistant can control your ConnectSense SmartOutlet 2 from your Google Home device. Connecting to HomeKit remains much the same. After that, you don't have to interact with the app at all, although we understand why some people might. With the arrival of Home and Home on Mac, we don't really use any other manufacturer created applications, unless there's something that Home can't give us. In the case of the ConnectSense app, that addition that Home doesn't have is energy monitoring, so you can see how much energy devices are consuming and make informed choices about how you manage them. 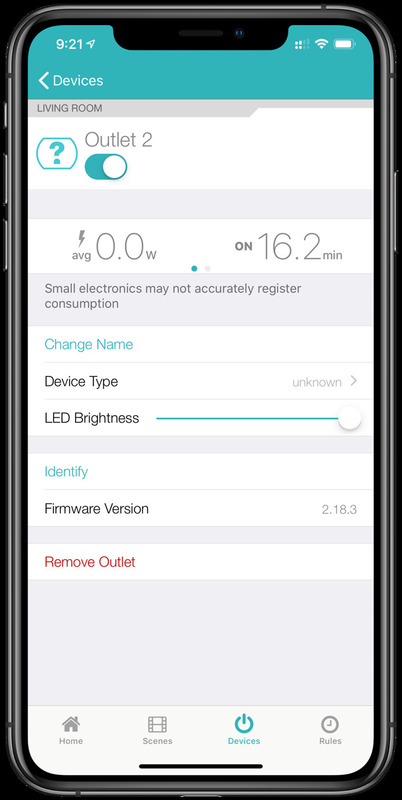 The app is also required for the occasional firmware update, which we had waiting for us for the first version of the outlet, and didn't know about because we hadn't used the app in ages. Energy monitoring is available in the app, which is a nice touch. Google's device setup is a little awkward. We tend to think of adding a new device, but Google's world thinks of this as adding an already-set-up device, because it was set up in the manufacturer's app. It means finding it in the list of supported devices, and then linking a ConnectSense account with a Google account. If that's too much Google for you, you could decide to add the ConnectSense skill from the Alexa iOS app, sign into your ConnectSense account, and link your ConnectSense account with the Alexa skill. Enabling the skill from the speaker won't work, because account linking has to be done at the phone. Once you've done that, tell Alexa to discover devices, and she should find the two outlets associated with the ConnectSense SmartOutlet2. Like Apple's Home app, the ConnectSense iOS app enables you to make custom schedules to turn on and off your plug-in devices automatically. You can schedule a lamp to turn on and make sure you never come home to a dark house or a fan to turn on at a certain time to ensure your home is cool. Every HomeKit device has a code unique to it, to allow for registration. In the case of this particular switch, these numbers for the product are on the back, and obscured when plugged in. This is annoying, but isn't a deal-breaker as the code can be entered manually, and the manual does have a code included on its last page. Despite the code location, overall, setting it up for HomeKit was easier than for Google Home or Alexa. Once set up, it works well across all three platforms. It should come as no surprise that it switches more quickly when using HomeKit - communications are local, and don't have to go up to the cloud to communicate with a ConnectSense account. ConnectSense v2 is available now, costs $59 and will be available through Amazon or direct from ConnectSense.